Mr Hughes was on the Today programme this morning to talk about reforms to the family justice system which have come into force today. One feature of the reforms is a 26-week time limit for the completion of court cases involving care and supervision orders. The cases decide on whether to grant a local authority parental responsibility over a child, or allow it certain powers to supervise the current carer or carers. Mr Hughes said that although the average time taken for such cases had been over 50 weeks it had recently come down to 33 weeks, something confirmed by the Ministry of Justice's (MOJ) quarterly court statistics. The figures only go back to early 2010 because of changes to the way the MoJ collects information from courts, so we don't know whether the decline is a long term trend or if the 50 week average seen in 2011 was typical of the system prior to the reforms. 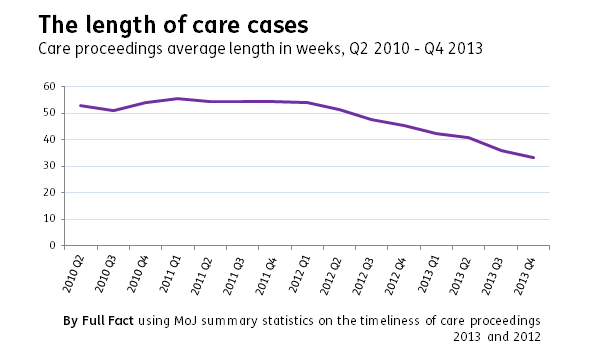 Previous figures cited in Parliament found that the average time taken to deliver a care or supervision order was around 50 weeks in the period from 2006-2009, but unlike the figures used by Mr Hughes these do not include cases in which the application was refused. Sure Start: have hundreds of centres been lost? Do TV licence offences account for one in ten court cases?